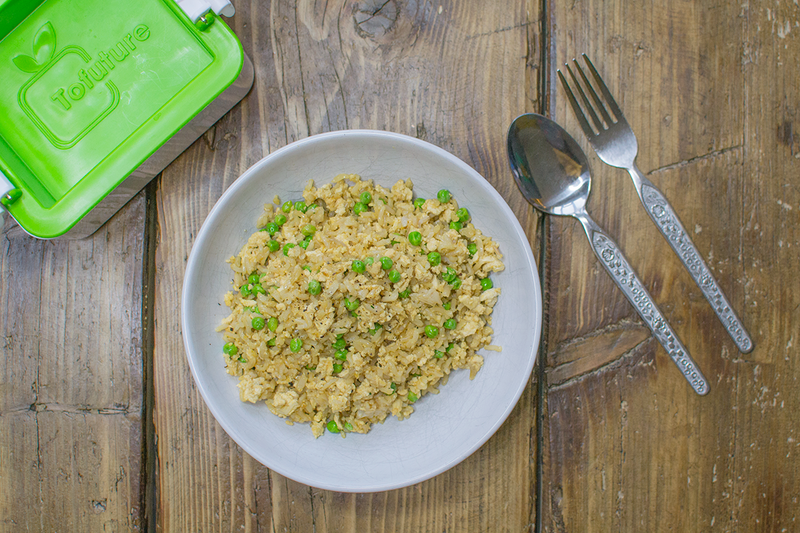 This tofu fried rice recipe is a vegan alternative to egg fried rice which I used to love in my pre-vegan days. I mash the tofu and use it instead of the egg and it works really well. It’s so quick and easy to make too, I usually always have the ingredients in the house which means I quite frequently rustle it up when I haven’t been shopping. I use the Cauldron tofu in this recipe as I find it works well even though I prefer the Tofoo Co tofu for other recipes. I also got to try out my new tofu press that the people over at Tofuture send to me. I’ve never owned a tofu press, although I sometimes use some kitchen roll and something heavy, but it just never works very well. I was actually surprised at just how well the tofu press worked, you can see how much water came out of it in just two hours in the video at the bottom of the page. It’s a great product plus it’s dishwasher and safe and BPA free. You can also use it for marinating tofu. It makes a huge difference and stops it being so soggy, you can still make this recipe without one though. Just make sure to cook the tofu for a bit longer to cook off the extra moisture. Here is the recipe, you can use less oil if you wish and also leave out the stock powder to reduce the salt content. And here is the video I made showing you how the tofu fried rice is made and also how I used the tofu press. Thank you to Tofuture for sending me the tofu press, you can find them on their website as well as lots of recipes and info about tofu so do go and check them out here.